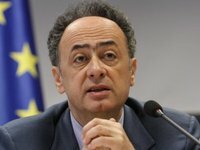 The EU-Ukraine Association Agreement is producing positive results, and Ukraine is integrating economically in the EU, Head of the EU Delegation to Ukraine Hugues Mingarelli has said. According to him, the integration of Ukraine into the European economy will improve the investment attractiveness of the country. If we can integrate Ukraine into the common market, into the European economy, this will create very positive conditions for investors, for trade and, finally, for creating jobs in Ukraine and in Kharkiv region, the diplomat added. He noted what he said is the huge potential of Kharkiv region for the development of cooperation with the EU, in particular in the field of innovation, small and medium-sized enterprises (SME), energy efficiency, decentralization and health care. The head of the Kharkiv Regional State Administration, Yulia Svitlychna, said she highly appreciated the level of cooperation between the region and the EU countries and the EU Delegation in Ukraine. "We have very powerful and dynamic relations with the EU Delegation in Ukraine both in foreign trade issues and in the implementation of humanitarian and economic programs. In 2018, Kharkiv enterprises increased exports to EU countries by 30%. And we have very clear plan for further cooperation," Svitlychna said.